Blindness can and does occur in the Shar-Pei. One of the major causes is uncorrected entropion. If entropion (rolling in of the eyelids) is not corrected several changes occur which can lead to blindness. Entropion can lead to severe corneal damage, ulceration and ultimately, corneal scarring. The corneal response to chronic irritation is to protect itself by forming scar tissue on its surface. This tissue appears cloudy, often with a brown pigment. Blood vessels can be seen on the surface and the cornea appears rough and irregular. With the clear cornea rendered opaque the dog is functionally blind. Drying of the cornea can also cause similar changes and is seen in a condition calledkeratoconjunctivitis sicca (KCS). In this condition, there is a decrease in tear production primarily in the lacrimal gland. This can occur as a sequela to viral infection such as distemper, herpes virus and others or as a primary immune-mediated destruction of the lacrimal gland. The decrease in tear production results in drying of the cornea and the formation of scar tissue as a protective response. A Schirmer Tear Test, which measures tear production, can be easily done to diagnose this condition and treatment is possible. KCS also seems to occur more often in those dogs that have had “cherry eye” or prolapse of the gland of the third eyelid in which the gland was removed instead of tacked back into position. Tacking is much preferred in treating cherry eye for this reason. Other causes of blindness we will discuss are glaucoma, optic neuritis, Sudden Acquired Retinal Degeneration (SARD) and retinal detachment/hemorrhage. Before we get into a discussion of some of the other diseases which can cause blindness we need to review the anatomy and physiology of the eye a little bit. The cornea must be clear and unobstructed to allow light and the visual image to enter the eyeball. The lens likewise must be clear to allow light and the image to enter the eyeball. The retina must be functional to capture the visual image and process it. The optic nerve must be intact to transmit the visual image from the retina to the brain. The brain must be functional to process the electrical impulses from the retina and allow a visual image to be “seen” by the dog. I realize this is a very simplistic explanation of a very complex process. 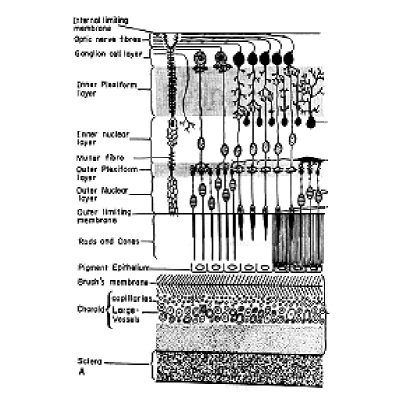 The retina itself is composed of several layers consisting of supporting tissue, blood supply, nervous connections, rods (night vision), cones (color vision), etc. The basic function of the retina is to take the visual image projected on the retina and convert it to electrical impulses, which can be transmitted and processed by the brain. Sudden acquired retinal degeneration (SARD) is a retinal disease seen in Shar-Pei as well as other breeds of dogs. Remember the retina is the photoreceptor layer of the eye, which is responsible for converting visual images to electrical signals. These signals are transmitted to the brain where the image is processed. This condition leads to a very sudden onset of blindness, which occurs over a period of a few days to several weeks. The retina is normal when viewed with an ophthalmoscope, but there is a loss of photoreceptor activity as evidenced by a diminished electroretinogram (ERG). The ERG is a test which measures the electrical activity of the retina. Synonyms for SARD are “toxic metabolic retinopathy” and “silent retina syndrome”. Shar-Pei with SARD are usually middle-aged females many of whom are overweight and may have symptoms of Cushing’s disease or hyperadrenocorticism – increased water consumption, increased urination, panting, increased appetite, etc. Often there are laboratory changes in the blood tests consistent with hyperadrenocorticism such as an increase in liver tests such as the alkaline phosphatase, alanine transaminase (used to be the SGPT) and cholesterol. Some of these dogs will have abnormal ACTH stimulation or low-dose dexamethasone suppression tests confirming hyperadrenocorticism. I must emphasize that a link between SARD and hyperadrenocorticism has not been proven although I would recommend that all Shar-Pei with SARD be evaluated for hyperadrenocorticism. Treatment for hyperadrenocorticism will not result in a return of vision. Not all dogs with SARD have hyperadrenocorticism, but the percentage is higher than in the normal dog population. The cause of SARD is not known at this time, but one theory suggests that perhaps an abnormal corticosteroid has a role in the disease process as well as being involved in the hyperadrenocorticism. There is no treatment for SARD and the dog will be permanently blind. Your veterinarian should rule out other causes of blindness in Shar-Pei which include glaucoma, retinal detachment (sometimes accompanying hypertension with kidney disease), pigmentary keratitis, optic neuritis, etc. SARDS appears to be an immune-mediated disease caused by localized intra-retinal production of autoantibodies that attack retinal neurons. A similar disease occurs in humans and is called immune-mediated retinopathy – irreversible blindness. A new test called Colorimetric Pupil Light Reflex Evaluation has been developed to differentiate SARDS patients from patients that have other retinopathies. SARDS patients have a strong PLR (pupilary light reflex) to blue light (480nm, 200kcd/M2) but no PLR when red light of the same intensity is used. The ERG (electroretinogram) is also a very useful test. The ERG is diagnostic in dogs because it is extinguished in all cases of SARDS. In optic neuritis the ERG is normal. In SARDS the PLR is decreased or absent initially and retinal degeneration occurs later — it appears that the cone photoreceptors are spared to a greater extent than the rods. An experimental treatment has been developed in dogs using human intravenous immunoglobulins (IVIg). IVIg is a mixture of different globulins found in healthy humans. It is a mosaic of normal antibodies that prevent the immune system from attacking antigens regularly encountered by the body. This treatment has been successful in restoring sight a few dogs if used within 4 weeks of onset of blindness. The dogs regained functional vision not normal vision. Currently the research work is being done in the Ophthalmology Department at the Iowa State University College of Veterinary Medicine. This is an inflammatory condition of the optic nerve which can result in acute, bilateral loss of vision. Degenerative changes in the optic nerve can result in similar symptoms and are more correctly termed optic neuropathy. If the optic nerve is affected as it leaves the back of the retina changes can be observed on evaluating the retina with an ophthalmoscope. If the optic nerve is affected behind the eyeball the retina may appear normal. Causes include infectious diseases such as canine distemper, toxoplasmosis, and others, various types of cancer such as lymphoma and tumors involving the orbit or bony eyeball socket, vitamin A deficiency, trauma, other diseases of the orbit such as abscesses and cellulitis and unknown causes. The vast majority of optic neuritis in dogs is due to unknown causes. Early treatment is imperative and involves the use of steroids. The prognosis is guarded and recurrences are common. Glaucoma is simply an increase in fluid pressure within the eyeball. 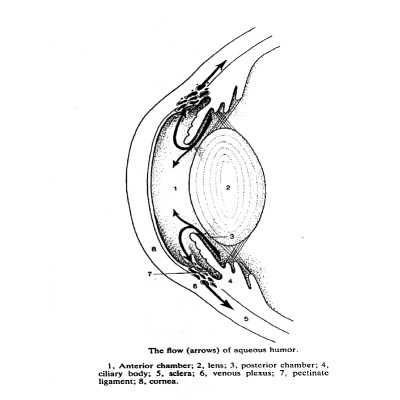 Figure 2 is a cross-section of the eyeball showing the flow of aqueous fluid in the eye. The production and drainage of this fluid is largely responsible for the pressure inside the eye. Key elements are the ciliary body (4) which produces the aqueous fluid which flows through the pupil into the anterior chamber (1) and drains out the drainage angle (7). Glaucoma is classified as primary or secondary. Primary glaucoma occurs in the Shar-Pei due to a genetically pre-programmed narrowing of the drainage angle. This interferes with drainage of the aqueous fluid and causes an increase in intraocular pressure. Secondary glaucoma occurs in the Shar-Pei as a result of lens luxation. This is inherited as a simple autosomal recessive trait in the Shar-Pei (Primary lens luxation in the Chinese Shar-Pei: clinical and hereditary characteristics; Lazarus JA, Pickett JP, and Champagne ES; Veterinary Ophthalmology (1998)1, 101-107). When the lens (2) shifts out of normal position it usually shifts forward obstructing the pupil and interfering with drainage of aqueous fluid and causing a rise in the intraocular pressure. Clinical signs include conjunctivitis (“bloodshot eyes”), cloudy cornea, swollen (buphthalmos) painful eyes, squinting, increases tearing, and pupil size can vary depending on the stage of glaucoma but most often the pupil is fixed and dilated. Diagnosis is based on measurement of intraocular pressure (IOP). Normal values in the dog are 15-25 mmHg. Anything above 25 mmHg is abnormal and glaucoma treatment should be initiated immediately – the increased pressure can cause lose of vision within 4-24 hours depending on how rapidly the pressure increases. One problem I see in Shar-Pei is that early on they may have intermittent pressure spikes and be normal in between these episodes. Also squinting may be mistaken for entropion. Medical treatment, in the dog, is usually not successful long term. Surgical options, in a visual eye, involve destroying some of the ciliary body by freezing (cryothermy) or laser destruction (laser cyclophotocoagulation), or placing a glaucoma shunt. In a blind eye in which the pressure can’t be controlled medically options include removing the eyeball, using an intraocular prosthesis or injecting the eyeball with gentamicin to destroy ciliary tissue. These are procedures done by a veterinary ophthalmologist. This is a common cause of blindness in the Chinese Shar-Pei. Dogs do develop secondary hypertension or high blood pressure. Primary hypertension, as commonly occurs in humans, has not been documented in the dog, as yet. Increased blood pressure often occurs secondary to kidney disease, primarily glomerulonephritis, Cushing’s disease, and heart disease. High blood pressure can result in bleeding into the retina due to rupture of the tiny blood vessels located there. This hemorrhage can lead to damage with subsequent scarring of the retina or blood building up behind the retina and causing a detachment. Blindness can result. Retinal detachment can also occur as a result of head trauma. This may be treated with anti-inflammatory medication, anti-hypertensive medication and treatment of the primary disease problem. 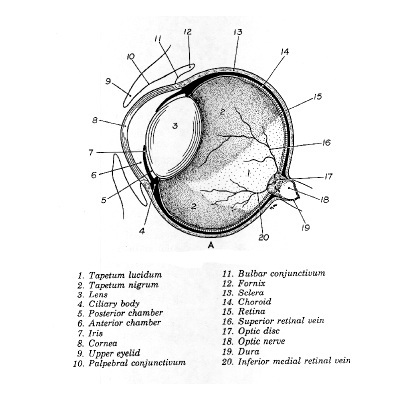 Before discussion of the next ocular condition it is necessary to review the anatomy of the retina. The major area of interest is the layer containing the rods and cones. Rods are very sensitive, but are less capable of fine vision discrimination and function in night vision. Cones are less light sensitive, but enable fine vision discrimination and function primarily in day vision. The rods are primarily located in the peripheral retina and the cones are located primarily in the central retina. In some species (such as humans) the cones contain pigments which allow for color vision. Some nocturnal species have only rods in their retinas. I have not personally heard of this group of ocular diseases in the Shar-Pei, but have heard references to the Shar-Pei in discussions of PRA. PRA is also referred to as Progressive Retinal Degeneration. This disorder is classified into 3 broad categories. PRA Type 1 also known as generalized progressive retinal atrophy can occur in any breed of dog even if the disease is not a severe problem in the breed. Here the rods undergo early degeneration resulting in loss of night vision followed by degeneration of the cones resulting in loss of day vision. Age of onset, rate of progression, severity, etc. varies and is unpredictable. In the breeds in which the genetics have been worked out it is inherited as a simple autosomal recessive trait. PRA Type 2 also known as central progessive retinal atrophy primarily affects working and hunting breeds. Visual deficits in this type of PRA are generally less severe and don’t usually occur until middle age. PRA Type 2 is a pigment epithelial dystrophy, which progresses to involve the entire retina. Total blindness is uncommon. PRA Type 3 is a simple autosomal recessive disorder, which affects the cones in the retina of the Alaskan malamute and the miniature poodle resulting in day blindness. There is no treatment for the various types of PRA. Don’t change the environment much. Dogs memorize the layout of the house and yard. Keep blind dogs on a leash in a new environment. Help them with stairs, doors and other obstacles. Watch blind dogs around other dogs. Dogs don’t always realize blind dogs can’t see and may fight when they get bumped into or stared at by a blind dog. While their hearing is unaffected, blind dogs seem to have some trouble in orienting to sound. Blindness is not unique to Shar-Pei and owners need to be aware that blind dogs can have an excellent quality of life. They need us to be their eyes.